Comments: Lucinda Bowling (Nee: McFadden) | Langnau Ky United States | | Comments: Lucinda was the daughter of Westerfield McFadden and Mary Williams. She was born in 1863 in Laurel County, Kentucky. She married Alex Bowling. This photo was taken in about 1890. The back of the photo of Lucinda and Alex says that it was taken in Laugnau, Ky. 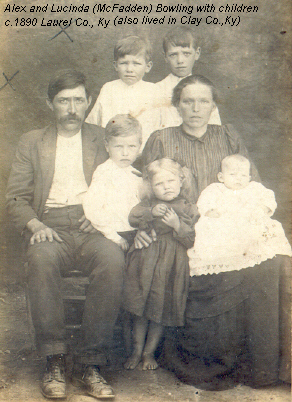 They also lived in Clay County, Kentucky.